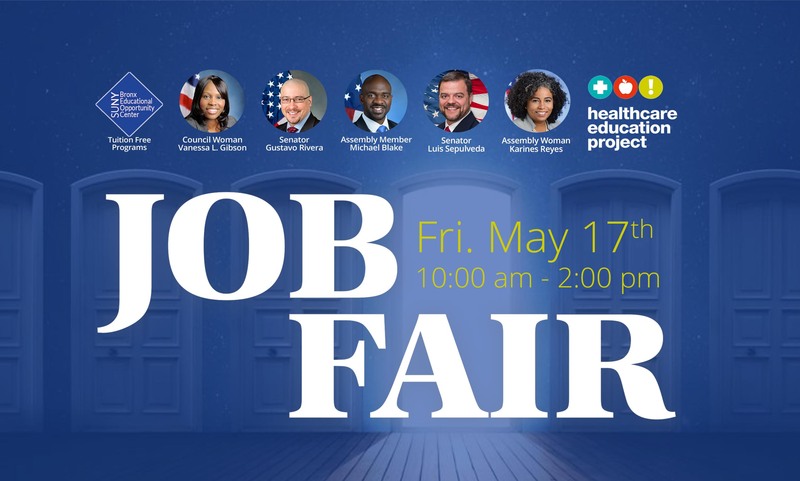 You are cordially invited to the annual spring Job Fair of the SUNY Bronx EOC, sponsored by NYC Council Member Vanessa L. Gibson, NYS Senator Gustavo Rivera, NYS Assembly Member Michael Blake, NYS Senator Luis R. Sepulveda, NYS Assembly Member Karines Reyes & 1199 SEIU Healthcare Education Project. Our aim is to open doors of opportunties for the 21st century. This year we are expecting over 40 employers seeking qualified candidates for a variety of employment opportunities. Some of the industries are: Healthcare, Direct Support, Technology, Civil Service, Security, Education and more. Register to let us know that you are coming. Simply complete the registration form today. Should you have any questions, please contact us at (718) 530-7000. We look forward to connecting you with employers.